Urbana Corporation, in essence a closed-end fund focused on stock exchanges, released it’s annual report for the year 2011 previous month. Initially I didn’t intend to write an update because the report didn’t really contain any news. The company is publishing an overview of it’s NAV and portfolio holdings every week, so there are no surprises with regards to the portfolio performance or the number of shares bought back. Urbana is steadily buying back shares, reducing the share count from a peak of 87.5M in the beginning of 2010 to 72.5M now. Since the company is trading at a significant discount to NAV those share buybacks add to the value per share for remaining share holders in a meaningful way (the discount was around 45% when I initiated my position in November, and is currently still around 40%). At the same time the company has ~3% in overhead costs per year, so thanks to the buybacks Urbana should currently have a portfolio that is capable of outperforming the market with 1.44%/year. And a fund that’s capable of outperformance should trade at a premium! But this of course can’t be true for Urbana since the outperformance can only be realized while trading at a discount and it certainly should trade at some discount because of the high fees. What we want is to find an equilibrium where the fees of the Urbana corporate structure are exactly cancelled by the share buybacks. Before we can do that we need to take a look at another variable: the expected return of the portfolio. If you would for example expect that the equities in the Urbana portfolio have a return of 6%/year in the long run it would imply that a discount of 50% would be fair if the company would not be buying back shares. With a 6% return and a 3% expense ratio you would basically have a situation where 50% of the earnings are siphoned off. With a higher return assumption a fair discount would be smaller since you would need a smaller part of the asset base to cover the fixed 3% costs. With some crude Excel work to include the effect of share buybacks I get a fair discount of 14% when we assume that the expected future market return is 10%, and a fair discount of 20% when the market return is 4%. So I think it’s safe to say that a discount around 17% would be appropriate for Urbana Corporation. And while I’m waiting for the gap between the current ~40% discount to close to less than 20% I’m owning an asset that should outperform the market with ~1.4%/year. So unlike a lot of other asset based plays I don’t really care how fast value is realized. Either the discount remains big and I can make money because the company can grow intrinsic value at above average rates by buying back shares, or the discount simply gets smaller. I would prefer the last option, but it’s not a situation where you will end up with terrible returns if it’s going to take ages before this happens. This entry was posted in Portfolio and tagged URB-A.TO, URB.TO on April 13, 2012 by Alpha Vulture. Assumption #3 is a bit optimistic, right? Probably: the company has indicated that it wants to continue the share buybacks as long the discount to NAV remains big, but at the same time they also indicated that they don’t want to liquidate too much. I certainly would expect that they continue the current buyback program for a few more years (if the discount remains high). Assumption #4 on the other hand is a little bit pessimistic: while I don’t expect anything at all the next few years I don’t think Urbana is going to exist indefinitely. I disagree. Seeing how Caldwell is compensated based on the size of the fund, assuming that the buybacks will continue indefinitely or even for the next few years is too optimistic. It is more likely that the manger is buying back just enough to keep the shareholders from revolting. I totally agree that it’s far from perfect, but it’s not all bad (see my original write-up on Urbana for the full details, but in short: insiders do own part of the fund shares as well, and Caldwell does have a way bigger interest in Caldwell Securities, and he can’t afford to screw investors too bad if he doesn’t want to hurt the more important company). The problem with insiders owning a closed end fund is: they get back the management fee that they pay, so their interests are not aligned with yours. In theory, Caldwell could crank up the management fee to earn a nice salary for years, while squeezing everybody out of the fund so he can buy back the underlying assets at a huge discount in the end. I’ve done a little bit research on some other CEF’s where this seemed to happen. I own Urbana as well, but I think your assumptions are somewhat naive: you expect the buybacks to continue for years because that would be the rational, right thing to do. And you ignore the fact that the fund manager could retire in a few years by screwing over some anonymous retail shareholders. Assumptions are the mother of all fuckups right? I’d say assumption # 1 might be the hardest one to make. Not that I’ve really looked at the numbers — has the portfolio actually kept pace with the market YTD? The portfolio is not really performing exactly the same as the market, and that’s not a surprise since a huge part of the portfolio are two positions in NYX and CBOE (so far these stocks are underperforming compared to the market). 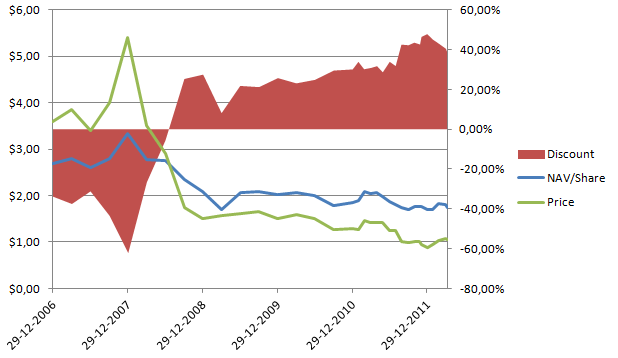 The turnover in the portfolio is extremely low, so no real reason for long-term underperformance (or outperformance). restirw: I’m well aware that the situation is far from perfect, but because I’m trying to nuance some remarks that point out legitimate concerns I think it might seem that I’m overly optimistic. Incentives for management are absolutely not aligned with shareholders as good as you would want, and I think I have done a decent job in the original write-up in describing where the Urbana situation sits between black and white. * The past history is not consistent with a manager that wants to screw shareholders as hard as he can: the company has been buying back shares for two years in a row, and actions matter more than anything else imo. They started buying back shares when the discount was smaller, and since then management has indicated that they want to continue the program as long as a significant discount exists, and so far they have delivered on that promise. * Caldwell has a big interest in Caldwell Securities: and if he doesn’t want to hurt this business he can’t screw over Urbana shareholders. I’m not expecting him to behave nice because it’s the right thing to do, I expect him to behave nice because it’s in his best interest. The fund manager is not some ‘poor’ guy that can get rich easy by screwing over retail clients. He’s already rich, but he could lose a lot of wealth if business for Caldwell Securities declines.